Burnley manager Sean Dyche said "football is about dreams" after his side moved into fourth place in the Premier League with victory over Stoke at Turf Moor. Substitute Ashley Barnes struck two minutes from time to ensure the Clarets' remarkable start to the campaign continued. Barring the first two days of this season - when not every team had played - this is the highest they have been in the top flight since March 1975. "It's a run of results and a start which the fans are enjoying and rightly so," said Dyche. "Football is about realities but also about dreams. It's a tough task for us winning games at this level but, Leicester blew the roof off dreams in football." Since 2003, Leicester are the only English club other than Arsenal, Chelsea, Liverpool, Manchester City, Manchester United and Tottenham to have played in the Champions League proper, doing so after winning the title in 2015-16. 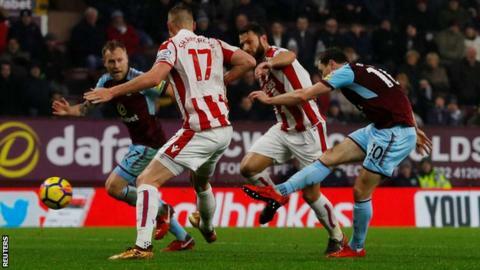 Barnes' strike - after the ball ricocheted off team-mate Scott Arfield - was one of few clear-cut chances in the match, though Stoke's Peter Crouch hit the post early on. Dyche's side climb into the Champions League places above Arsenal, Liverpool and Tottenham - who all play on Wednesday - while Stoke stay 15th. "We found a way to win and a fine goal," said Dyche. "We're not the real deal, we're a side that are improving. "I keep reality because this division will eat you alive. We're having a real go at what we can achieve this season." Burnley were not at their best for much of the game - perhaps inhibited by the prospect of leapfrogging some of the Premier League's biggest names, even if only for 24 hours. Steven Defour was the only Clarets player to have a shot on target prior to Barnes' decisive strike - his second goal of the season. Indeed the most alarming moment for Stoke goalkeeper Jack Butland in the first half came when he fumbled the slippery ball from a looping cross, but he quickly recovered. It was a typically determined display by Dyche's side, whose eighth clean sheet of the season is only bettered by Manchester United's nine. A sixth 1-0 win of 2017-18 shows how well they can close out tight games, and they are 14 points and 12 places better off than after 17 games last season. Dizzy heights and European nights? Burnley's climb into the top four will have some fans dreaming of the return of European football to Turf Moor. The Clarets' last European venture was in the Fairs Cup in 1966-67, six years after a memorable flirtation with the European Cup. Winning the league in 1960 put Harry Potts' side into Europe's elite club competition - and they won both of their home matches. But, after beating Reims on aggregate, defeat by Hamburg in the quarter-finals brought an end to their first European adventure. They looked well placed to return in 1975, but having climbed into the top three on 21 March, a side featuring players such as Leighton James and Brian Flynn eventually finished 10th. While Dyche's stock is on the rise, defeat will only increase the focus on Stoke counterpart Mark Hughes. The Potters players were confronted by angry fans at the city's railway station after sharing a train following their 5-1 defeat by Tottenham on Saturday. Hughes hoped that would provoke a response from his players, and he certainly got one in the early stages. But Stoke were ultimately unable to take advantage of an unusually tentative Burnley as they slipped to a fourth defeat in their past five games. "Don't tell me that anyone says Burnley deserved to win that, because they didn't," Hughes said. "The lads are devastated. "We'll be OK, we're fine. We are working hard to try to turn this around but I am encouraged by what I've seen tonight." The 16 points Stoke have taken from their opening 17 games is their lowest at this stage of a Premier League season. And Barnes' goal was the 36th they have conceded in the league this season - the worst record in the top flight. Burnley manager Sean Dyche: "We're having a real go at what we can achieve this season. I'm not being negative. I'm a realist, there's a lot of challenges coming our way. The fans and the town have got to enjoy these times, why wouldn't you? "A lot of psychology goes into some of our planning. I want the players to know that they can grow here, develop as players and get results. We are moving forward each season." Stoke manager Mark Hughes: "I thought the lads were fantastic and matched everything Burnley threw at us. I thought when we were able to get the ball down, we were the team trying to create openings in wide areas and get good balls in. On the goal: "Another long ball goes into our box and it drops fortunately for the lad. It's hard to take. I'm pleased with what we produced." Burnley have taken six points from goals in the last 10 minutes of their top-flight games this season; only Manchester City have managed more (9). Premier League games at Turf Moor this season have produced just 10 goals (in nine games), five fewer than any other ground. Arfield has registered two goal involvements in his past two Premier League games, as many as in his previous 55 in the competition. Burnley travel to the south coast to face Brighton on Saturday at 15:00 GMT, while Stoke host West Ham at the same time. Match ends, Burnley 1, Stoke City 0. Second Half ends, Burnley 1, Stoke City 0. Attempt saved. Eric Maxim Choupo-Moting (Stoke City) header from the left side of the box is saved in the centre of the goal. Assisted by Erik Pieters with a cross. Corner, Burnley. Conceded by Erik Pieters. Goal! Burnley 1, Stoke City 0. Ashley Barnes (Burnley) right footed shot from the centre of the box to the bottom right corner. Assisted by Scott Arfield. Attempt missed. James Tarkowski (Burnley) header from the centre of the box misses to the left. Assisted by Johann Berg Gudmundsson with a cross following a corner. Corner, Burnley. Conceded by Eric Maxim Choupo-Moting. Attempt missed. Peter Crouch (Stoke City) left footed shot from the centre of the box is too high. Assisted by Mame Biram Diouf with a headed pass. Attempt saved. Eric Maxim Choupo-Moting (Stoke City) right footed shot from outside the box is saved in the top centre of the goal. Assisted by Peter Crouch. Attempt missed. Ramadan Sobhi (Stoke City) right footed shot from outside the box misses to the right following a corner. Corner, Stoke City. Conceded by Jack Cork. Substitution, Stoke City. Eric Maxim Choupo-Moting replaces Xherdan Shaqiri. Hand ball by Xherdan Shaqiri (Stoke City). Attempt missed. Ashley Barnes (Burnley) right footed shot from outside the box misses to the left. Attempt missed. Darren Fletcher (Stoke City) right footed shot from outside the box is too high. Offside, Stoke City. Mame Biram Diouf tries a through ball, but Xherdan Shaqiri is caught offside. Attempt missed. Johann Berg Gudmundsson (Burnley) left footed shot from the left side of the box is high and wide to the left. Assisted by Chris Wood. Attempt saved. Steven Defour (Burnley) right footed shot from outside the box is saved in the bottom left corner. Substitution, Stoke City. Kevin Wimmer replaces Kurt Zouma because of an injury.